To catch big bass this spring, parallel shallow banks with a Rapala® BX® Brat square-bill and don’t be shy about crashing it into rocks, laydowns, dock posts and scattered grass. Most bites will come after those collisions. 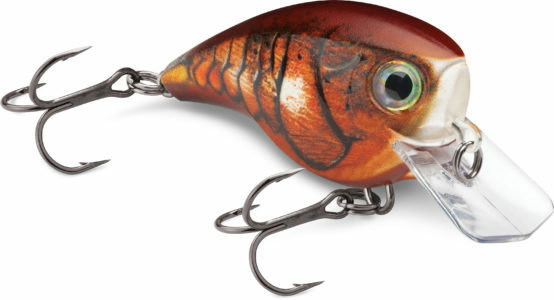 Rapala BX Brat square-bill crankbaits feature a balsa-wood core within a brawny hard-plastic shell. Rapala’s balsa baits famously float up and back out of cover well, minimizing snags. Encasing their balsa core in armor allows Brats to bounce off cover and trigger bites without hanging up often and getting beat up. “The Brat’s got all the characteristics of balsa, but with plastic on the outside to protect the bait,” explains Rapala Pro Mike Iaconelli, the only angler to have won a Bassmaster Classic, Bassmaster Angler of the Year and B.A.S.S. Nation Championship. To get the most bites, cast a BX Brat just past shallow rocks, laydowns, brush or submerged grass and retrieve it right over or through that cover. For the best results, cast a BX Brat parallel to the shore – rather than perpendicular – to ensure it makes bottom contact throughout the majority of your retrieve. It’s key to “keep your bait in the zone where you can keep contact with the bottom for as much of the cast as you can,” Swindle explains. A modified square-bill lip – its comes to a slight point in the middle – causes a BX Brat to carom off cover differently than other square-bill baits. “That’s what’s triggers those reaction bites,” says Rapala Pro Ott DeFoe, 2011 Bassmaster Rookie of the Year and 4-time Bassmaster tournament winner. Unique flat sides and a V-cut belly give the BX Brat additional swimming action. Its hard-plastic shell adds weight, helping it cast “like a dream,” DeFoe says. BX Brats are available in 12 color patterns: Blue Ghost, Blaze, Bone Craw, Carbon, Delta, Haymaker, Homer’s Buddy, Mossy, Pearl Gray Shiner, Tamale, Silver and Rock Solid. More often than not, natural color patterns are best in clear to lightly stained water, and brighter patterns are best in stained to muddy water. This entry was posted in Rapala. Bookmark the permalink. Can you give more details as to what lines (type and pound test)provide the 1 foot to 8 foot results. A good option would be Sufix Mono in a 10-12lb range!